Moroccanoil Hair Smoothing Spa Treatment, products, price, service at Head Turners Kolkata. For the last few days, I am pampering myself and well, I am pampering well. It was only two weeks ago I went for a salon session. This time I got an invite from the brand Moroccanoil to try out their treatment and see how I feel about it. Let's begin. I was given an appointment at Head Turners and I was greeted by an extremely efficient and friendly manager Farzana who booked my appointment and facilitated the entire process. As usual, I went looking through the inventory of products to take a look at the products. I am trying to relax my always jittery self. At first, my hair was washed with Moroccanoil Smoothing Shampoo ( priced at Rs 1800) and then some amount of Treatment Oil (priced Rs 2655 ) was mixed with the Moroccanoil Hair Mask ( Rs 2790) and applied in sections avoiding the roots. Then, the hair expert Zafar massaged my head carefully for quite some time and let the mask stay for some time more. Yes! So many words of wisdom. I learned quite some tips and tricks which I carefully listened to for you. I shall be sharing in a separate post. Next, my hair was rinsed again. By the time, it was already feeling smooth. He took a big coin size of the treatment oil again and started applying it to the tips moving upwards. Then, whatever little was left , he rubbed on the front sections and again, spread everything very well. Next, he wrapped my hair in a hot towel. Now that my hair was ready, he put on a Heat Protection Lotion and blow dried it. of course you can get the style according to your preference. At the end, a Finishing Glimmer Shine ( Non Aerosol) Spray prices Rs 1665 was misted all over for more shine and my my! I am in love with myself!!! Results? After the Moroccanoil Session my hair feels incredibly smooth, soft, shiny and well not the mention the expertise of Zafar who blow dried it so well that I don't want water near my hair lest I ruin it! The best part of this treatment is that, it does not necessarily need steam which means you can even get this done at home. You can use steam or hot towel or make do of everything without heat. I think it's better to go to the salon because professional blow dries do make a difference at the end and it's best handled by the experts. Head Turners Salon Short Street/Loudon Street did an amazing job. The service comes at Rs 2500 for 1 hr 15 minutes which I deem is expensive given a hair trim is not inclusive. But, on noticing how expensive the products used are and how generously they used and how nicely they worked, I think the price is justified. I have a mind to go in for another session in sometime (provided I have time in the next two months) and I always look for value for money services. Honestly, I think this one is. Another note: I simply cannot believe how beautiful my hair smells. It has already been 5 hours and I love the scent which is lingering in my hair. I think I am going to bite the bullet and buy the treatment oil. 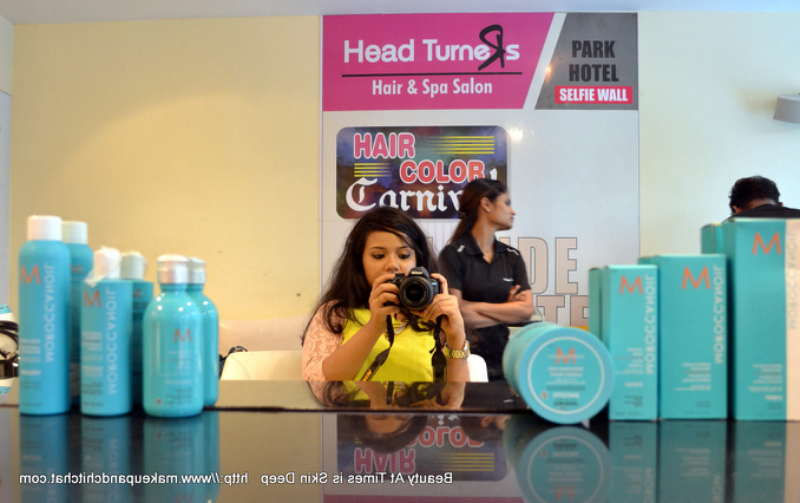 Also, this session and the earlier session with Himalaya Herbals gives me the thoughts of permanently straightening my hair. I am not sure because I get easily bored with my hair. 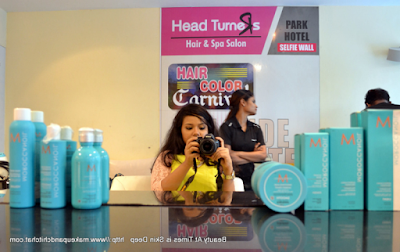 Anyway, here is my experience of Moroccanoil Treatment at Head Turners. You can check out the store website and go in for a session if you want it too. 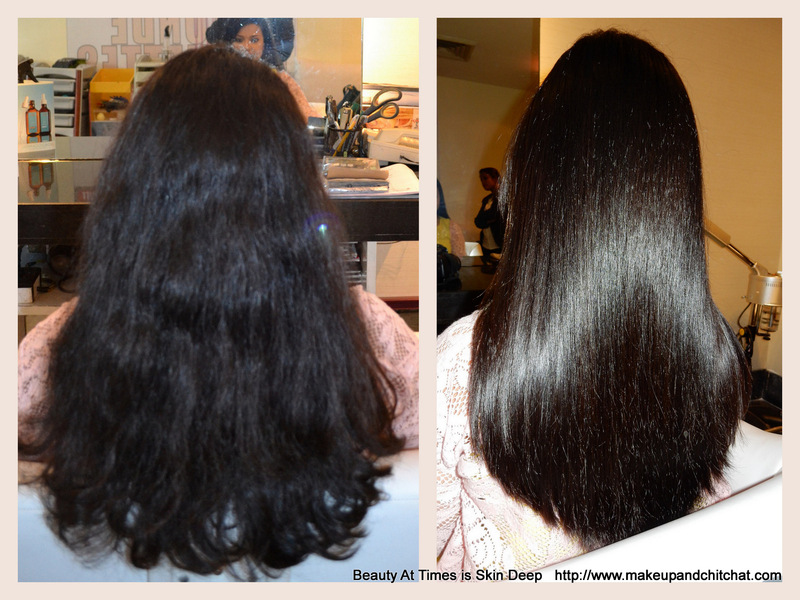 Speaking for myself, I am extremely satisfied both with the salon service and with the session. I hope the effect lasts for a long time. Shall update you on the same soon. Thank you Tarannum. My hair still feels soft and fragrant. Not sure what would happen once I wash it though. Hope at least the smoothing effect is long lasting. OMG your hair looks so gorgeous. Isn't it? I think I should be going in for occasional treatments like this one! Wow...wow...wow !! It's damn good ! Expensive but worth it for any special occasion..cant wait to try it ! You are spot on. I wouldn't call it very affordable, but when the hair needs something special, this is surely a treat. Besides, the stylist did an excellent job here. Even I want to go back for the range. The price is killing, but the products felt so amazing! I wanetd to get the oil from Kerastase, but then, the scent has changed my heart. I also think it also largely depends on the salon and their expertise because the stylist at the Salon did not use too much of heat, or rather, he blow dried my hair so beautifully that I felt he used less heat that stylists normally do. Yet the after effect is so amazing. So smooth your hair has become, may I know that after this treatment, can you wet your hair? Soumi, please feel free to ask me anything you like! See, I think the beautiful effect I got is also because of the expertise of the stylist and since I have mostly staying home, I have not washed my hair yet. Would you please give me a wee bit of time? I would be washing my hair tomorrow and keep you posted on the same?